John MURRAY b. 1729, 3rd Duke of Atholl, and Charlotte MURRAY, (daughter of James MURRAY and Jean) Duchess of Atholl. John died 1774. I. Charles MURRAY-AYNSLEY b. 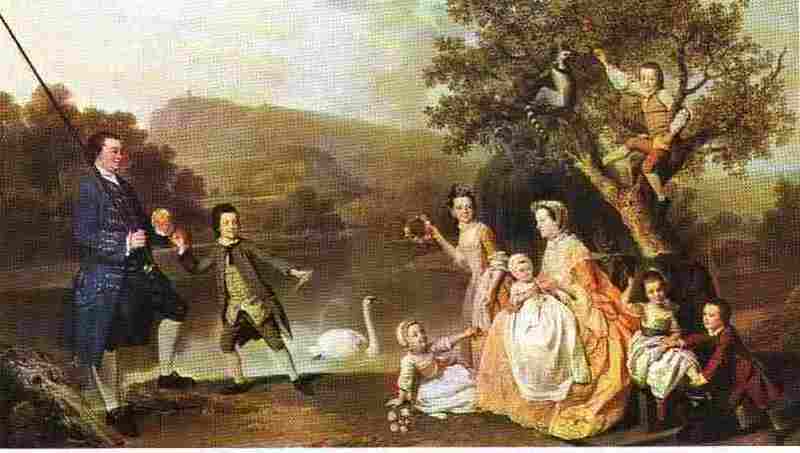 21 Oct 1771, Reverend Lord, m. 18 Jun 1793, Alice MITFORD, (daughter of George MITFORD). Charles died 5 May 1808. A. John MURRAY-AYNSLEY b. 2 Jun 1795, and Emma Sara PEACH. John died 25 Mar 1870. 1. George Herbert MURRAY-AYNSLEY b. 4 Sep 1826, Maj. General, occupation Madras Light Cavalry, m. 12 Feb 1848, Emily HAND. George died 10 Jul 1887.
a. Maud MURRAY-AYNSLEY b. 18 Mar 1860, m. 24 Dec 1881, in Bangalore India, Charles Maximilian Thomas WESTERN, b. 2 Sep 1855, Cloisters Bath, (son of Charles Maximilian Thomas WESTERN and Harriet BALFOUR) Lt. Col., occupation Royal Artillery, d. 1 Aug 1913, In Trondhjem Norway, buried: 11 Sep 1913, St Marks R.C. Church East Hendred Berks. Maud died 3 Mar 1898. (1) Charles Maximilian Thomas WESTERN b. 16 Dec 1882, d. 1930. (2) Charles Edward Murray WESTERN b. 22 Mar 1885, Aden, Lt.Col, occupation Indian Army, m. (1) 5 May 1917, in Jullunder, Mary Ellen DONALD, b. 1900, d. 1945, m. (2) Abt 1950, Marjorie. Charles died 1965, Exmouth Devon. (a) Brian James Murray WESTERN (son of Charles Edward Murray WESTERN and Mary Ellen DONALD) b. 11 Jul 1918, Murree India, Major, occupation Retired Indian Army, m. 26 Jul 1948, Mary BISSEKER, b. 31 Dec 1925, Paris, France. MY FATHER---------(b) Patrick Donald WESTERN (son of Charles Edward Murray WESTERN and Mary Ellen DONALD) b. 19 Apr 1920, Mussoorie India, 10 May 1920, Church of Sacred Heart Mussoorie India, m. 16 Jun 1951, in Streatham London, Shelia Leslie JOHNSTONE-BLACK, b. 27 Nov 1932, London, (daughter of Richard Leslie JOHNSTONE-BLACK and Kathlene Mary WILKINSON). Patrick died 1 Nov 1995, Coulsdon Surrey, buried: 10 Nov 1995, Bandon Hill Cemetery Wallington Surrey. (3) Maud Harriet Atholl WESTERN d. Abt 1970. II. George MURRAY b. 1761, Rev. Lord,Bishop of St. Davids, d. 1803. A. Caroline Leonora MURRAY b. 1788, m. FEB 1812, Henry Stephen STRANGEWAYS, b. 21 FEB 1787, Earl of Ilchester 3rd, d. 3 JAN 1858. Caroline died 8 JAN 1819. 1. Theresa Anna Maria Fox STRANGEWAYS b. 1814, m. 27 JUN 1837, Edward St. Vincent DIGBY, b. 21 JUN 1809, Baron Digby 9th, d. 16 OCT 1889. Theresa died 2 MAY 1874.
a. Leonora Caroline DIGBY m. 5 JAN 1864, Alexander Hugh BARING, b. 1835, (son of Francis BARING and Hortense Eugenie Claire MARET) MP, Baron Ashburton 4th, d. 18 JUL 1889. Leonora died 19 AUG 1930. (1) Francis Denzil Edward BARING b. 20 JUL 1866, Baron Ashburton 5th, m. (1) 25 JUL 1889, Mabel Edith HOOD, (daughter of Francis Wheler HOOD and Edith Lydia Drummond WARD) Hon., d. 18 JAN 1904, m. (2) 19 FEB 1906, Frances DONNELLY. Francis died 27 MAR 1938. (a) Venetia Marjorie Mabel BARING (daughter of Francis Denzil Edward BARING and Mabel Edith HOOD) b. 30 APR 1890. (b) Aurea Vera BARING (daughter of Francis Denzil Edward BARING and Mabel Edith HOOD) b. 11 AUG 1891, Hon., m. 10 JAN 1917, Charles James BALFOUR, b. 8 FEB 1889, (son of Charles Barrington BALFOUR and Helena (Nina) MCDONNELL) Major, d. 18 AUG 1939. (c) Angela Mildred BARING (daughter of Francis Denzil Edward BARING and Mabel Edith HOOD) b. 9 DEC 1893. (d) Violet Alma Madeline BARING (daughter of Francis Denzil Edward BARING and Mabel Edith HOOD) b. 12 SEP 1895. (e) Alexander Francis St.Vincent BARING (son of Francis Denzil Edward BARING and Mabel Edith HOOD) b. 7 APR 1898, Baron Ashburton 6th. (2) Frederick Arthur BARING b. 18 SEP 1867, Capt, m. 30 APR 1890, Laura Louisa HOBSON, (daughter of F HOBSON). (a) Evelyn Claire BARING b. 22 MAR 1891. (3) Alexander Henry BARING b. 4 SEP 1869, d. 21 JAN 1948. (4) Guy Victor BARING b. 26 FEB 1873, Lt.Col, MP, m. 16 JUL 1903, Olive Alethea SMITH, (daughter of Hugh Colin SMITH and Constance Maria Josepha ADEANE). Guy died 15 SEP 1916, WWI. (a) Oliver Hugh BARING b. 19 MAY 1904, d. 19 JAN 1908. (b) Simon Alexander Vivian BARING b. 22 NOV 1905, m. (1) 1 MAY 1935, Jeanne SALMOND, (daughter of Felix SALMOND) m. (2) 24 OCT 1946, Pamela Rachel Cameron GRANT-STURGIS, (daughter of Mark Beresford Russell GRANT-STURGIS). (c) Olivier Constance Leonora BARING b. 3 JUL 1908, m. 11 OCT 1941, Cecil H FEILDEN, (son of Guy FEILDEN) Major. (d) Amyas Evelyn Giles BARING b. 21 JAN 1910, m. 25 MAY 1935, Mona MULLINS, (daughter of W B, MULLINS). (e) Aubrey George Adeane BARING b. 3 MAY 1912. (f) Esmond Charles BARING b. 11 MAR 1914, Major, m. 16 APR 1936, Zalia SNAGGE, (daughter of Harold Edward SNAGGE). (5) Lilian Theresa Claire BARING b. 28 MAY 1874, m. 28 MAY 1874, Frederick Loch ADAM, (son of W P ADAM) Lt.Col., d. 31 MAR 1907. (6) Caryl Digby BARING b. 13 JAN 1880, Lieut., m. 28 NOV 1907, Ivy FIRMAN, (daughter of Humphrey Brooke FIRMAN). (a) Denzil BARING b. 24 MAR 1909, Major. (b) Leonora Jacqueline BARING b. 2 AUG 1912. (7) Dorothy Mary BARING b. 28 SEP 1885, d. 11 APR 1893.
b. Edward Henry Trafalgar Digby b. 1846,10th Lord Digby, d. 1920. (1) Edward Kenelm DIGBY b. 1 AUG 1894,Baron Digby 11th, m. 1 JUL 1919, Constance Pamela Alice BRUCE, b. 14 JUN 1895, (daughter of Henry Campbell BRUCE and Constance Mary BECKETT) Hon. Edward died 1964. (a) Pamela Beryl DIGBY b. 20 MAR 1920, occupation US Ambassador to Paris, m. (1) 4 OCT 1939, Randolph Frederick Edward CHURCHILL, b. 28 MAY 1911, (son of Winston Leonard Spencer CHURCHILL and Clementine HOZIER) MP, d. 1968, m. (2) 1971, Avril HARRIMAN, occupation Railroad Magnate, d. 1986. Pamela died 5 FEB 1997, Paris, France.